BetCascade is one of the unique scammers we’re covering on USA Bookmakers. They’re different from other sportsbook scams in that, at one point, they used to be (considered) legit. From 2000 to about 2003, they were rated as high as an A- on the top industry watchdog sites. However, customers experienced some turbulence from there on out from BetCascade’s lack of ability, possibly desire, to pay their customers in a timely manner. Or at all, as was shown during the last couple of years they were in business. Surprising, to say the least, considering that they once cracked the Super Top 10 Sportsbook list, which was a combination of top sportsbooks based on the input of SBR, EOG and TheRX. But here we are. Lets look at their rise and fall in more detail. Maybe this can serve as a lesson for both punters and sportsbooks alike. There’s not a whole lot of insider information about BetCascade. From what we know they were (or are) based in Curacao. 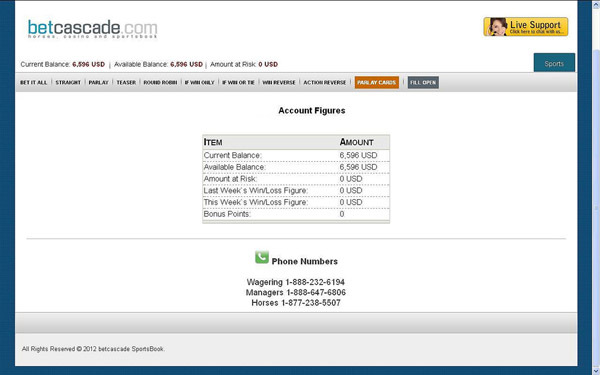 According to their website their email is: info@betcascade.com. I wouldn’t bother emailing them unless you plan on bitching about the funds they owe you. The scams they pulled off were the slow and no pay kinds. What made these scams so bad was that they were unsuspecting. When a book is paying on time, and is praised highly, no pays feel like they’re coming from out of the blue. A fluke, even. Unfortunately for players the no pays weren’t flukes. Things were up and down up until 2007, yet fell off a cliff from 2007 to 2008. Just from April 2007 to January 2008 it was calculated that BetCascade owed more than $1.27 million dollars to players. This caused their rating to be dropped to an F in September 2007. In 2008 a player complained that he was owed $4,000. BetCascade told that player that he would be paid soon, explaining further that the delays were due to a new setup. Apparently the had a new backer in charge of marketing and accepting funds, while BetCascade was taking the profits and paying back players (when/where they could). Reportedly, they paid out $22,000 to SBR members. Things progressively got worse, though. Sometime in late 2008, maybe 2009, BetCascade went from trying to pay players back, to having no intention on paying them back at all. I think this was clear in 2008 when they owed more than $1 million to players. However, players must’ve missed that memo, and their F rating. Case in point – one player complained in July 2010 that he had a balance of more than $1,500. He wasn’t able to get through to BetCascade to find out when, or if, he’d be paid. Another player deposited $1,500 about a year ago, just before BetCascade closed. BetCascade stated that they weren’t able to find any documents of the money being sent in. In the cases following early 2008, when it was obvious they owed a ton of money, it’s hard to tell whose to blame. Players should be doing their due diligence, researching rooms, their background and credibility. At the same time, though, sportsbooks like BetCascade shouldn’t continue to take wagers when they owe other players money, let alone enticing them to sign up by calling them up and offering 20% sign up deposit bonuses via phone. So while I think players need to do a better job researching sportsbooks, I still put the blame on BetCascade for their thievery. How were players tricked and what can we learn? There were a couple of things that contributed to BetCascade’s ability to scam players. First and foremost, they were a highly rated sportsbook in the beginning. My guess is that many players chalked up the initial slow/no pays to one-off errors, growing pains or harmless mistakes. They didn’t suspect that it would lead to what it did. Secondly, they continued to accept deposits in despite of owing players so much money. They didn’t shut down like a respectable business would have. Thirdly, and arguably the worst one of all, they opened additional portals to attract new customers. They opened sites like WagerMadness, BigWorldCasino and BetSportsInc. They also owned Playfast.tv. So I think an argument could be made that maybe this was their plan from the very beginning. Called me a conspiracy theorist, but why screw up a seemingly good reputation which could bring you years of million-dollar+ revenue, all for the short term, almighty buck? That doesn’t add up to me. Maybe it’s my ethics/morals, though, I don’t know. In addition to BetCascade, I think you need to also target Sportsbook Review (SBR) again. Again. From what I’ve seen in their forums, it is alleged that SBR John took a bribe to boost BetCascade up in rating. He states that BetCascade jumped up from a D+ to an A within a month’s time. Based on my research it took a lot longer than that, about 20-24 months, and it was progressive. So whether or not that’s true, it’s hard to say. But SBR John wouldn’t answer the question from what I’ve seen, and it’s hard to put it past them given our research into other sportsbooks like BetIslands. The bottom line is that BetCascade was able to run their scam because they leveraged the trust they built from the beginning, as well as the integrity of the SBR founders/owners. And as with Betislands, the BetCascade did not have a happy ending for all the customers SBR sent their way. Players would best take this less and apply it to how they search out new sportsbooks to join. I would suggest not taking any one review portal or friend’s advice for where to play. Collect all the information and advice you can, and make a decision from their based on what your gut is telling you. Ignore all the traps like fancy websites, shiny software, big promotions and loud-mouthed (paid) shills. Is the sportsbook still in business today? No. BetCascade doesn’t appear to be taking new customers. Their website is still up, but it’s only a login form. WagerMadness looks to be in the same position. – Bet Cascade Rundown at SBR – covers reports of everything positive/negative that BetCascade has done. – The BetCascade Scam – Further details of the scam by Sports Betting Online. – Under The Table Accusations – the theory that BetIslands quick rising rating was due to an unethical bribe that SBR accepted. – http://www.betcascade.com/index.html – BetCascade’s website.